Before launching into the punishing assault that defines its first half, Her Smell begins with about 45 seconds of bliss. Through the grain of a handheld camcorder, Becky Something (an indomitable Elizabeth Moss) and her two bandmates in the punk rock trio Something She clutch a copy of Spin magazine—it’s the band’s first big cover story, and a new jewel in their emerging label’s crown. Just as Becky and her bandmates’ giggling celebration starts to grow into real exultation, there’s a hard cut to the present day, where a radically different scenario is unfolding behind the scenes of a Something She concert. Here, we face Becky head-on: drunk, reckless, plainly suffering, without the rose-colored veil of a lo-fi home video. It’s the first of many jolting readjustments in Alex Ross Perry’s daring, mesmerizing new film. Unfolding in five discrete acts, the action is mostly confined to green rooms, recording studios, and backstage dressing areas. We encounter Becky Something on the verge of flaming out, with a waning stardom she can no longer control and child she doesn’t seem to care about. As addiction and schizoid unpredictability tank her career, Becky rejects help from her family members and continues to test her relationship with Something She bandmates Marielle Hell and Ali van der Wolff. A punk rock icon from a bygone era, Becky comes to terms with her own personal and professional disintegration by lashing out, hard. Everything that gives Becky Something such a compelling stage presence, and makes her such a hero to her longtime fans, is what repels those close to her. 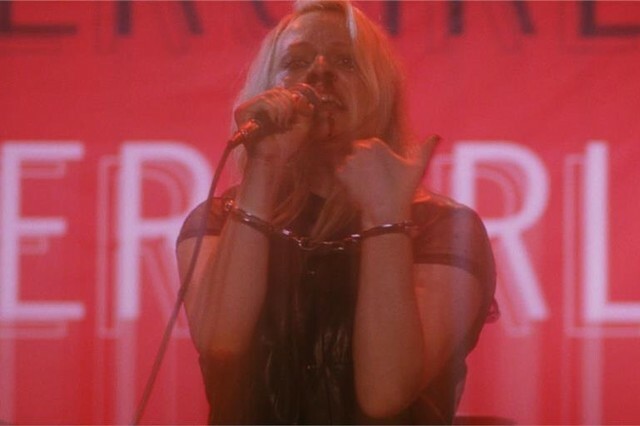 There’s an inherent voyeurism in Her Smell, as Perry forces us to confront this slow implosion of a rock star past her prime. Often, it’s a literal experience, as a roving camera takes us into bathroom stalls and private spiritual ceremonies. Moments of privacy are often disrupted, or taken public in increasingly uncomfortable ways as Becky Something descends into the depths of the third act. But more crucial to that experience of voyeurism is the presence of Becky’s entourage. 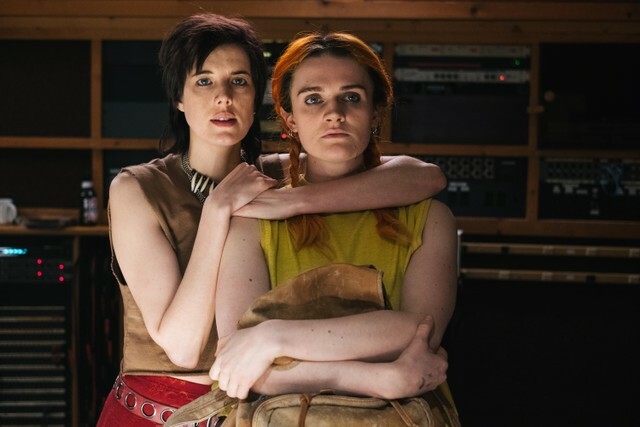 As Becky herself eventually reminds one bandmate, she is never alone; in grainy flashbacks and bloody meltdowns, Becky is constantly surrounded by other people. Through the secondhand disappointment and embarrassment of Becky’s bandmates, and of the label executive who’s invested so much in her over the years, given her so many chances, Becky’s self-destructive behavior compounds into something even more severe. In one especially difficult confrontation between Becky and her mother, the camera lingers almost exclusively on the face of Becky’s mother, foregrounding her pain over her daughter’s as the two approach a boiling point. In that scene, as in much of Her Smell, a tension persists between Sean Price Williams’ grounded, claustrophobic camerawork and the characters’ physical relationships to each other. As bandmates, family members, and fans mill about on screen, they’re constantly being blown aside by the tornado that is Becky Something. In moments when she bursts through doorways into extreme closeups, the physical reticence of her entourage betrays a kind of emotional weakness, or a willingness to enable her worst tendencies. We intuit as much from these moments of unconscious physical expression as from Perry’s relentlessly original dialog. From the first time we see Becky perform, it’s clear that for all her repulsive, destructive tendencies, there’s something ineffably magnetic about her. Even at her worst, she harnesses an irresistible charisma that keeps people drawn to her. There’s recurring line in Her Smell about “The Becky Show,” as if it’s her world and the rest of the characters are just living in it. But far from being about a single, polarizing personality, the movie is ultimately about the collective, those people drawn to Becky, even as they know she’ll disappointment them. These characters constitute an entire solar system, revolving dutifully and inexorably around the unstable star that will eventually grow to swallow them up. Even after all Becky has put them through, these people love and care for her. Perry manages to capture in uncompromising detail the experience of love without reciprocation—what it’s like to know an addict, or someone unable to help themselves; the emotional center of the film lies equally in Becky and in the faces of those who surround her. Her Smell is more than your typically nihilistic punk rock odyssey. If its first three acts are a descent into hell, or some kind of heroic katabasis, the final two represent clear, measurable growth. When the curtains literally close at the end of the third act, Perry suddenly embraces a much cooler tonal palette, with blues, grays, and whites as the dominant color scheme. When the anxious, detuned rumbling of the score lets up, like tinnitus subsiding, Becky Something finds herself sober, with a newfound discipline and perspective. But even in these calmer stretches, there are still more than a few heart-stopping moments near the end, when Perry plays with letting everything slide back into disarray. 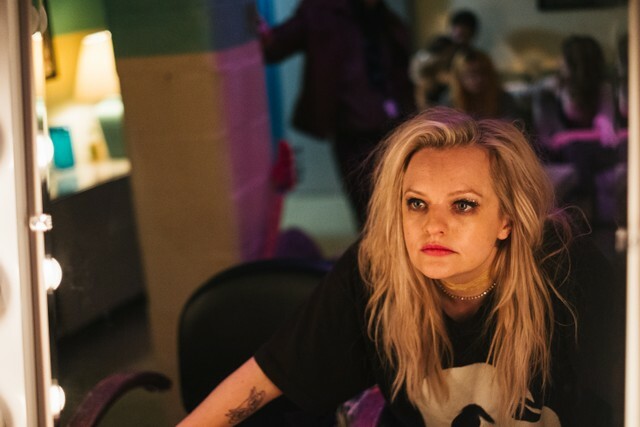 For a movie about coming to terms with collapse, Her Smell exhibits a surprising amount of heart. By the end of the film, when Becky has let us down more times than we can count, and when we’ve almost completely lost faith in her, a sequence of stunning moments between Becky and her daughter (involving a heartfelt cover of Bryan Adams’ “Heaven”) give us a reason to believe in her again. Becky Something’s redemptive arc is a testament to the idea that even in our darkest moments, close personal relationships offer a chance for salvation.